Scientists have discovered a dinosaur-like creature 10 million years older than the earliest known dinosaurs. 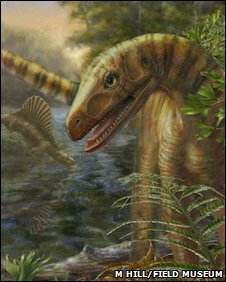 Asilisaurus kongwe is a newly discovered herbivore that lived during the middle Triassic period - about 245 million years ago. The scientists say that its age suggests that dinosaurs were also on the Earth earlier than previously thought. They described their findings in the journal Nature. The study was led by Dr Sterling Nesbitt from the University of Texas at Austin in the US. He said: "This new evidence suggests that [dinosaurs] were really only one of several large and distinct groups of animals that exploded in diversity in the Triassic period, including silesaurs [like this one], pterosaurs, and several groups of crocodilian relatives." Dr Randall Irmis from the Utah Museum of Natural History in the US was also involved in the study. He said that this group of creatures - the silesaurs - were the "closest relative of the dinosaurs". 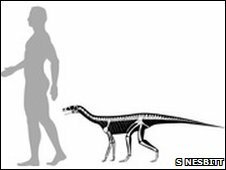 "It was to dinosaurs much like chimps are to humans - kind of cousins," he told BBC News. "Since we have one line of the family tree, the other branch must have existed at the same time. So this suggests there are other very early dinosaurs that we haven't found yet." He also said that the creature was not what the researchers expected an early dinosaur cousin to look like. "It was a weird little creature," he said. "We always thought the earliest relatives were small, bipedal, carnivorous animals. "These walked on four legs and had beaks and herbivore-like teeth." Dr Paul Barrett, a palaeontologist from the Natural History Museum in London said that the finding provided scientists with important information about how dinosaurs evolved. "The creatures share a lot of features with dinosaurs," he said. "They show us an intermediate step between more primitive reptiles and the more specialised dinosaurs." The fossil record indicates that this group of primitive creatures went extinct approximately 45 million years after they emerged. The dinosaurs, on the other hand, were far more successful and walked the Earth for about 165 million years. Dr Barrett said: "[Silesaurids] were like a failed experiment in how to build a dinosaur."